In the spectrum of things, she is a vocalist, composer, collaborator and a person who believes she must also do for the larger good. Getting the Sangita Kalanidhi conferred by the Music Academy this year, Padmashri Aruna Sairam has added another feather to the proverbial cap. Getting awards is not the big thing here. What she does and that too constantly, is her search and pursuit of excellence and the adherence to her passion that is classical Carnatic music. And in that, is her own growth and the stature she commands. Nothing seems to hold her back as she goes from strength to strength and her popularity only growing. Her formidable voice and musical knowledge apart, she makes a lovely visual on stage with her glittering saris and accessories – which by the way adds to her allure. And so on December 15, the inaugural day of the Music Academy Annual Conference with Indra Nooyi, chairman, Pepsico as the chief guest, she is all set to dominate the coming music season. And on January 1, at the Sadas she will be conferred the award by Governor Banwarilal Purohit. In the spectrum of things, she is a vocalist, composer, collaborator and a person who believes she must also do for the larger good. She has taken Carnatic music beyond borders and has performed across countries - from small forums to really big ones like the Rashtrapati Bhavan, Royal Albert Hall, Royal Festival Hall, Carnegie Hall to name a few. What is more, her concerts draw a cross section of people, who love her kind of music and the way it sounds. She plays many roles and not the least of them is that of a mentor herself by involving youngsters through Nadayogam Trust, which she founded and also to others around the world. Hers is the kind of music that has at its very roots tremendous bhakti and classicism. The foundation to this began very early in life in Mumbai ,where she began learning first from her mother Rajalakshmi Sethuraman, who belonged to the Veena Dhanammal school known for its strict adherence to tradition and form. Then she went on to learn from T. Brinda, another great who laid the foundation of her excellence. Aruna, being open to different influences, was also mentored at various points by M. Balamuralikrishna, K.V. Narayanasw-amy and S. Ramachandran. While her proficiency in classical Carnatic music is a given, what actually gave her individualistic identity when she burst upon the concert platform at a time much younger vocalists were ruling, was the way she sang abhangs. They became so popular that audiences started swelling at every concert to the extent that abhangs became synonymous with her. Because of her versatility, she collaborated with western artistes, especially using the abhangs as a unifying musical sound – case in point, Dominique Vellard. The foundation for this step could, perhaps, have been laid from her early years in Mumbai where her family was steeped in music and eminent musicians. Her father Sethuraman, a music connoisseur hosted many musicians and dancers in their home. As a child, Aruna demonstrated extraordinary aptitude for music. It won her first gold medal at the age of eight at the Shanmukhananda Sabha competition in Mumbai . 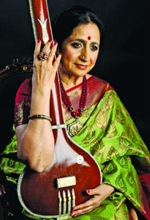 At 14, she gave her her first full-length solo concert at the Rama Navami festival, Bhajana Samaj again Mumbai . She turned 21, and won the Best Young Musician Award at the annual conference held at Music Academy, Chennai year ago. She has not looked back since. When you watch her on stage she plunges you into another world where everything else stops and there is only music. It is the power of her voice and the strength with which she powers on without seeming to flag. And that is something hard for many others to create -- that sense of being on a rollercoaster of melodies and passion. Her concerts are invariably full house-- try getting a ticket to her cutcherries during the season? Most probably would be sold out! Whether is a tillanna, a padam or a varnam or a seemingly simple devotional bhajan, she is riveting when she takes centre stage. Aruna has also conceptualized and performed themed concerts such as Aruna - Thousand Names of Divine Mother', a concert and recording project first produced in Germany. The recording was done in the crypt of a Benedictine monastery in Germany with co-artists Christian Bollmann and Michael Reimann. ‘Sources' - are a series of collaborations by Aruna and Dominique Vellard, a master of Gregorian and medieval song. Aruna and Dominique went on to join forces with the Moroccan Sufi vocalist Noureddine Tahiri folding in music of the later Arab-Andalusian tradition as evident in the album Trialogue.Matrubhumi – is a journey through India from the Himalayas to Kanyakumari. This concert was performed with Shankar Mahadevan. Strains of Heaven was with Mandolin U Srinivas, exploring dialogues between the voice and the string. Aikya - is a concert in 14 Indian languages celebrated India's unity in diversity. The Wisdom of Vitthala and Rang Ahangwere dedicated to abhangs. Le Bebe Bleu a French production (The Blue Baby) depicting the story of Lord Krishna directed by French Theatre Director Dominique Pompougnac. The most important segment of audience for this production was the children of France. Collaboration with Dance - Aruna composed music and sang for the production Yantra and Bhinna-Pravaha of dance choreographer Chandralekha. She has also performed Sammohanam - a confluence of music and dance with Malavika Sarukkai. It's a journey of achievements and fulfilment and the milestones are truly momentous. © Copyright 2012 - 2018, Aruna Sairam. All Rights Reserved.